The word “fail” comes to mind here. Barack Obama gave the very first State of the Union Address since September 11, 2001 that utterly failed to mention al Qaeda even a single time. Barack Obama at this point in his “presidency” is THE most documented liar in the sum total of human history. There is not a single human being who EVER LIVED – whether it was Nixon or Hitler or Stalin or Attila the Hun or Belshazzar or you name it – who has ever been exposed in more lies or in more areas than Barack Hussein Obama. Just one of the many lies Obama told was his “Yemen lie” as he released terrorist after terrorist from Gitmo to that terrorist country while he dishonestly claimed that he had broken the back of terrorism. Over the last several years, we have consistently taken the fight to terrorists who threaten our country. . .We’ve targeted al Qaeda’s affiliate in Yemen, and recently eliminated the top commander of its affiliate in Somalia. . . . This strategy of taking out terrorists who threaten us [without deploying U.S. troops], while supporting partners on the front lines, is one that we have successfully pursued in Yemen and Somalia for years. History now reveals that Barack Hussein Obama is the very worst kind of arrogant fool. It wasn’t a “State of the Union” address; it was a “State of Delusion” address. It was lies from a liar to a people who prefer lies to the truth. 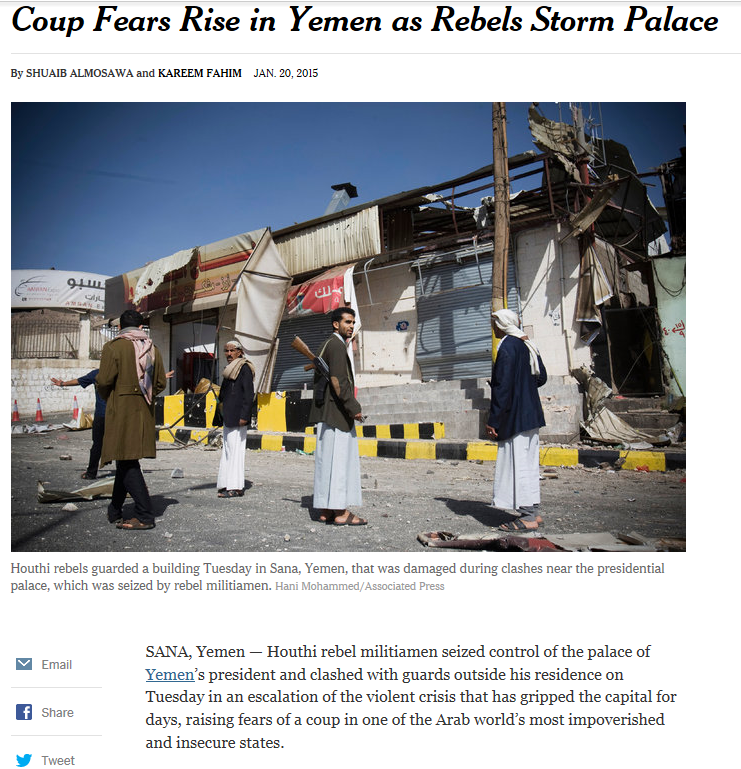 And today, just three days after Obama’s State of the Delusion speech, the president of Yemen resigns, and the sub-headlines scream that the collapse will benefit al Qaeda as the nation fractures into mini-states (most of which will facilitate terror attacks). Mind you, this is the same Queen of Liars who dishonestly trumpeted the demise of al Qaeda thirty-two times AFTER al Qaeda overran United States territory in Libya, planted their terrorist flag and murdered our ambassador. And of course, this just keeps getting better and better – at least if you love Islam and love terrorism. Go back to the American collapse in Yemen: Who is the key backer of these terrorists that just took over the government in Yemen? The same Iran whom Obama radically and ridiculously swears he will not allow anything to happen to until after a nation that just inherited ballistic missile technology from Russia (after Obama and Hillary Clinton reset relations with those thugs and after Obama mocked Mitt Romney for understanding the real world) builds its nuclear bombs. There’s really not a lot of point for Iran to build nuclear weapons until they have the means to deliver them. But all praise be to Allah, Obama is protecting Iran from Congress until after it’s too late while Russia helps them along just as Ezekiel chapter 38 and 39 prophesied. Mind you, this demon-possessed hypocrite was FINE citing Bible to justify his amnesty for illegal immigrants. Because like I said, our queen is a liar without shame, without honesty, without integrity, without virtue and without decency of any kind whatsoever. We are now suffering from stage four cancer of the soul and instead of chemotherapy, radiation and surgery we’re being fed sugar pill placebos. We now live in a fiasco of justice in which our president is freeing TERRORISTS from Gitmo while he tries to put people in prison for improperly labeling their calorie counts. We live in a menagerie in which our president refuses to meet with the Prime Minister of Israel but will meet with the Youtube leaders in cultural stupidity. Democrats, meanwhile, are dishonestly screaming over the GOP speaker of the House inviting a friend and an ally of every America BUT OBAMA’S “FUNDAMENTALLY TRANSFORMED” AMERICA to talk to them after they hypocritically and demonically celebrated their own House Speaker who ignored the Bush administration’s requests for Nancy Pelosi not to speak with a brutally inhuman terrorist dictator thug. At this point in time, if you are a Democrat, you are a liar who votes for liars and worships lies. And one day you will stand before the outrage of a just and holy God as flames billow forth from his fiery chariot throne and you will give an account for your vote for the murder of sixty million innocent babies and you will stand accountable for your demanding that the wrath of God be brought upon you and upon your children and upon your nation according to Romans chapter one verses 18-32. And hell will not be eternal enough for you to suffer for your crimes against everything that is holy. You will explain why you kept rabidly supporting your Queen of the Damned while the world burned and the nation formerly known as “One Nation Under God” imploded. Armageddon is coming. The mark of the beast is coming. And YOU brought it to reality while you hid in your disgraceful lies. This entry was posted on January 23, 2015 at 2:25 pm and is filed under abortion, Armegeddon, Barack Obama, Conservative Issues, Democrats, gay marriage, morality, Politics, religion, Religion and Culture, socialism, terrorism. You can follow any responses to this entry through the RSS 2.0 feed. You can skip to the end and leave a response. Pinging is currently not allowed. The Libs don’t value Truth as much as they value other things. They don’t value Truth as much as Conservatives do. Once Prager said that, it opened up my mind as to why the Libs act and believe as they do. Hitherto, I had projected onto Libs my own love and appreciation for Truth, Honesty, and Integrity. And so then it was simply a matter of long and patient effort to get them to embrace methods of sound and valid reasoning, of logic, of evaluating evidence, arguments, and facts in a manner befitting intellectual and moral integrity. And once a lib does that, then they’ll leave behind the intellectual and moral vacuity that Liberalism is. Boy, was I ever mistaken! You can argue with a Lib all day, and the vast, vast majority of them will never get it. It’s almost impossible. Of course, a precious few do thankfully leave liberalism behind, but it’s rather rare.